Adobe on Wednesday released an update to its InContext Editing service, the Web content maintenance tool introduced last fall in conjunction with Dreamweaver CS4. Version 1.5 of InContext Editing offers simplified administration and complete editing capabilities within the browser. InContext Editing is cross-platform and works with the latest versions of Safari, Firefox, and—for Windows users—Internet Explorer. InContext Editing lets Dreamweaver designers designate editable areas within their Web pages that non-technical clients can update in the browser from any location—without having to install special software. It operates much like any other word-processing software clients are likely familiar with. It works like this: The site administrator sends an invitation via e-mail to the client inviting him or her to update the site. The client has access only to certain sections of the site, so the client can change the content without breaking the design. 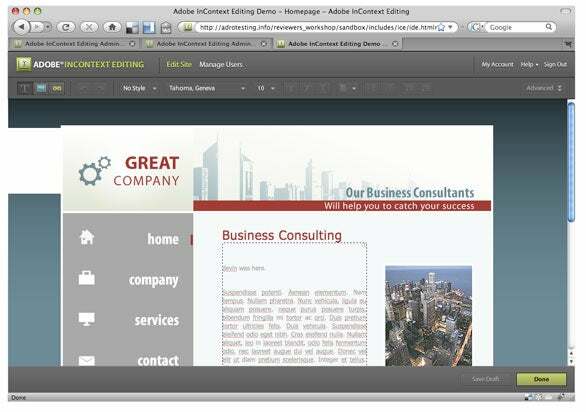 Within Dreamweaver CS4 designers can also specify editing options and define CSS styles that clients can use. Web designers who create sites with Dreamweaver CS3 or earlier can also access InContext Editing to assign editable regions through the browser. However, their access will be limited in that they won't be able to get the full editable region functionality as those designers who create their sites in CS4, according to Adobe. Web designers can now use the browser to designate what parts of a Web site the client can edit. Adobe says that InContext Editing is popular, and that’s one of the reasons it is offering this update. However, there are no public figures on how many people are actually using the service. Right now, the service is available only in North America to English-language customers, and while it supports text and static images, it will not handle video or other rich multimedia. For that, you’ll still need to use Contribute, the desktop client Web-updating tool. Voltmer said that Contribute CS4 continues to be available for enterprise clients and those whose systems include firewalls, advanced applications, rich media, and complex administration. The two client-based updaters are designed to co-exist, and target different audiences.